Over the last few years the Atlanta Jazz Festival has developed a pattern in its Main Stage lineup scheduling – on Saturday, the younger, less traditional artists are given the spotlight, with a chance to build an audience for their (and by extension, jazz’s) future. But Sundays remain for the more familiar names. The respected veterans who represent the jazz mainstream, the “Center” if you will. In 2014, pianist Ahmad Jamal and vocalist Freddy Cole were the Sunday headliners. This year, it’s two veterans of similar stature, saxophonist Pharoah Sanders and vocalist Diane Schuur, who are the big draws. But before they take the stage on Sunday night, we will hear from two intriguing groups – a super group trio of jazz heavyweights and a quartet of ATL’s finest jazz divas in a promising tribute to one of the all time greats. Early arrivals on this final day will be treated to a quartet of swinging Navy men who will play a variety of standards and instrumentals, to get the day started in a classy way. “Four Women” is the title of one the great Nina Simone’s most compelling and enduring compositions; a celebration of all shades, shapes, sizes, pains and ultimately, the unquenchable spirit of Black womanhood. Over the last few years, many great female vocalists have taken on the song as a centerpiece of a tribute to the incomparable “High Priestess of Soul”. This year, AJF38 has its own Four Women, who happen to be about the best jazz vocalists that the city can offer – Kathleen Bertrand, Julie Dexter, Rhonda Thomas and Terry Harper. Ms. Bertrand is a AJF veteran and one of the stars of Atlanta area jazz, having appeared as a headliner during the 2012 Festival and with Roy Ayers that same year. She has released a number of recommended albums, including Katharsis, which features the AJF’s unofficial anthem “Jazz in Piedmont Park”. The British born Julie Dexter has been an Atlanta resident since 1999. She has a broad and devoted fan base around the globe and moves easily between the jazz and R&B worlds. Ms. Dexter is also a past AJF artist. My family still talks of her impressive Main Stage set with Russell Gunn in 2012. Though I missed the 2013 AJF, I’ve heard that Ms. Dexter’s set that year was also a highlight. New York native Rhonda Thomas was a new name to me, until she was announced as part of this group. My research led me to her duet album with guitarist Michael Coppola Guess Who I Saw Today. Her range, and vocal versatility made me an instant fan. Anyone who can perform the under-appreciated modern classic “Miss Celie’s Blues” the way Ms. Thomas does, is alright with me. Terry Harper is also new to me but her family certainly isn’t. The vocalist is married to trumpeter/educator Danny Harper, whose younger brothers Phillip and Winard, formed The Harper Brothers, one of the best of the “Young Lion” groups of the 90’s. Terry, Danny and the rest of their family are also the hosts of The Harper Family Jam Session, each Thursday night at Atlanta’s Best Jazz Spot, Churchill Grounds. These four ladies are proven talents. I’m expecting that somewhere, Ms. Simone will be smiling. Stanley Jordan on guitar; Jeff “Tain” Watts on drums; Charnett Moffett on bass. For cats like me, who cut their teeth on jazz during the 80’s/90’s renaissance, each of those cats is an icon, by himself. Now the three of them have come together to form a trio called Nettwork. The potential is mind-blowing. Jordan, you may recall, was one of the first artists signed to the newly revived Blue Note records in the ’80s. He set the jazz (and rock) world on fire with his amazing “touch” technique that allowed him to sound like multiple guitarists playing at once. Even thirty years later, his creativity is still astounding. Moffett, the son of drummer Charles Moffett was another wunderkind who hit the scene around the same time, also with astounding ability that garnered him legions of fans and work on over 200 recordings. And Watts, known to many as the drummer on The Tonight Show with Jay Leno, first came to fame for his work with Wynton and Branford Marsalis on their early work and he remains one of the best drummers alive on the planet. Why these cats had never thought of coming together before now, is a mystery. And with their various commitments, I get the feeling that their time working together now, will likely be brief. I glad that I’ll have the chance to catch them live. Diane Schuur first came to prominence around the same time as Moffett, Jordan and Watts. Discovered by Stan Getz, Ms. Schuur is one of those vocalists whose style is so singular that you know it’s her within the first few words of a song. Her career has now spanned over three decades, with two Grammy wins and many more nominations. She’s wailed in front of the Basie Band, sang the blues with B.B. King and on a recent album The Gathering, she displays some impressive Country chops. I’ve been a fan of Ms. Schuur’s since her first album Deedles in 1984 and it has been wonderful watch her grow from a young woman with impressive, if undisciplined pipes, into the mature and affecting song stylist that she is today. At AJF38 you can expect to hear Ms. Schuur sing selections from her catalog of over 20 albums, including her latest, I Remember You (With Love To Stan and Frank). The album is a heartfelt tribute to two of Schuur’s most important mentors, Getz and Frank Sinatra. We’ll also likely hear tunes that were made famous by Ms. Schuur’s biggest vocal influence, Dinah Washington. Regardless of the set list, it’s a great chance to hear one of jazz’s best living vocalists, practice her craft. 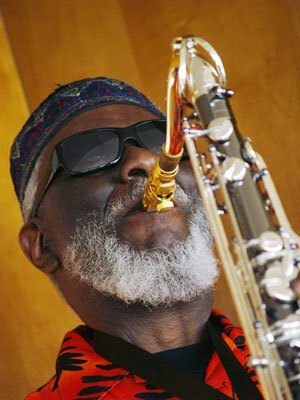 Pharoah Sanders is one of jazz’s handful of living iconic figures, a man who learned his craft literally beside John Coltrane, as the second tenor sax in Trane’s last groups. He also created one of the most unforgettable “free jazz” records of the of the late 60’s in “The Creator Has a Master Plan” (from his album Karma). In more recent times, he worked with rock oriented producers such as Bill Laswell, who have added another dimension to his sound and introduced Mr. Sanders to a new audience. Sanders sound has also mellowed a bit recently as he has begun to embrace the ballads and the melodic playing of his mentor Coltrane’s earlier years; yet Sanders has managed to maintain the some of the gritty intensity that has always been his trademark. Joining Pharoah Sanders will be Kurt Rosenwinkel, a fine guitarist with a fluid, yet edgy style that should provide a great compliment to Sanders’ big toned tenor. Together, I expect that they will create music that will push a few boundaries in order to keep things interesting. They may play ballads at times but they won’t be gentle. It should be an engaging set that will end AJF38 on a high note. You can hear the music of these and many other AJF38 Artists from 5 PM – 7 PM daily on our Curt’s Cafe Noir, our streaming 24/7 jazz radio station. Click HERE to listen now. This entry was posted on May 20, 2015 at 7:41 pm and is filed under Atlanta Jazz Festival 2015 with tags atlanta jazz festival, Atlanta Jazz Festival Main Stage, charnett moffett, diane schuur, four women, jeff tain watts, julie dexter, kathleen bertrand, Kurt Rosenwinkel Pharoah Sanders, Nina Simone, pharoah sanders, rhonda thomas, stanley jordan, terry harper. You can follow any responses to this entry through the RSS 2.0 feed. You can leave a response, or trackback from your own site.